With 35 years of experience, Patio Furniture Doctors can create any look you are trying to achieve. 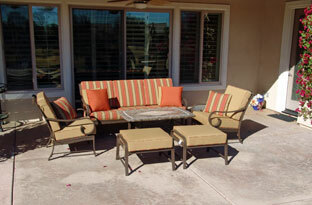 Not only can we make your patio furniture look brand new, but we also provide custom patio furniture cushions. Whether you are looking to buy a new cushion or reupholster your current cushions, we work directly with you to help you select your fabric and ensure a smooth pickup and delivery. We are with you every step of the process to make sure that you receive a design that you love. We work with the top brand of outdoor cushions, Sunbrella, to give you the best design and quality you can find. Since 1961, Sunbrella has set the standard for quality performance fabric in the awning, marine and furniture industries. The story of Sunbrella is one of possibilities imagined and realized. Worry-free living is easy with durable Sunbrella fabrics. In ordinary fabrics, dyes are added to the surface of the yarn or fabric. The color only penetrates the outer layer and washes out or fades away over time. The color in Sunbrella fabrics penetrates all the way to the core, ensuring years of vibrant color and performance in your fabrics. This color-to-the-core technology makes our fabrics easy to clean. In fact, most spills can be removed with mild soapy water and a soft bristle brush. For really tough stains, you can resort to cleaning with bleach. Enjoy time with your family and friends instead of worrying about those inevitable spills. Sunbrella is serious about protecting the environment and your everyday environment. From the Recycle My Sunbrella program to GREENGUARD certification to theunique coloring process that creates no wastewater from dyeing, Sunbrella does everything possible to produce stylish, durable fabrics without harming Mother Nature.